Gettysburg Licensed Battlefield Guide Deb Novotny is the host for our series on Evergreen Cemetery. 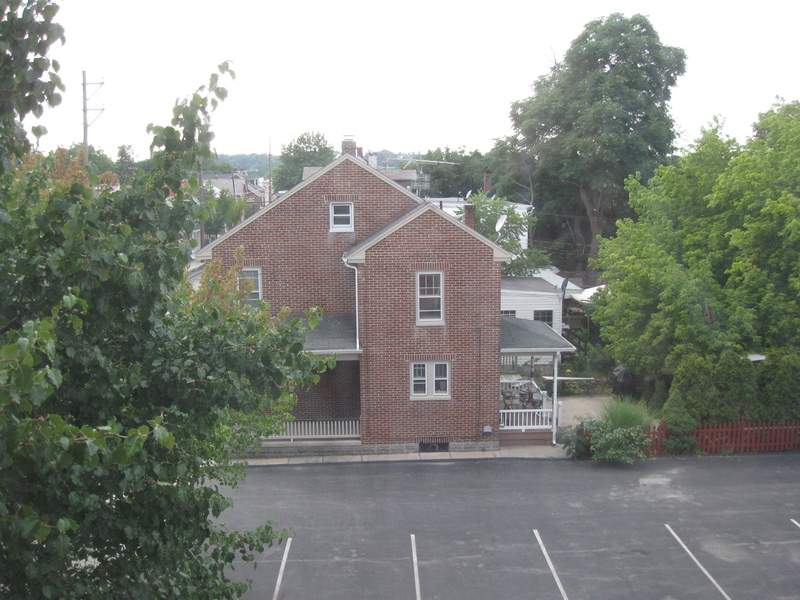 She is standing by the Michael Jacobs House on the northwest corner of Middle Street (parallel with the side of the house on which Deb is standing) and Washington Street (out of sight on the right, heading away from the camera). This view was taken facing northwest at approximately 4:00 PM on Thursday, August 18, 2011. Gettysburg Licensed Battlefield Guide Deb Novotny is a retired American History Teacher from Gettysburg High School. She has been a Licensed Battlefield Guide since 1975 and serves on the board of the Evergreen Cemetery Association. She is the host for our series on Evergreen Cemetery, Gettysburg’s civilian cemetery. To contact Licensed Battlefield Guide Deb Novotny, please click here to reveal her email address. In today’s post, Gettysburg Licensed Battlefield Guide Deb Novotny describes who Michael Jacobs was and shows some locations in the attic of the house where the Jacobs watched some events during the Battle of Gettysburg. We would like to thank Bobbie Phillips and John Phillips whose law firm, Phillips & Phillips, now occupies the Michael Jacobs House, for allowing us to visit and to take the images that we are able to produce in this post. 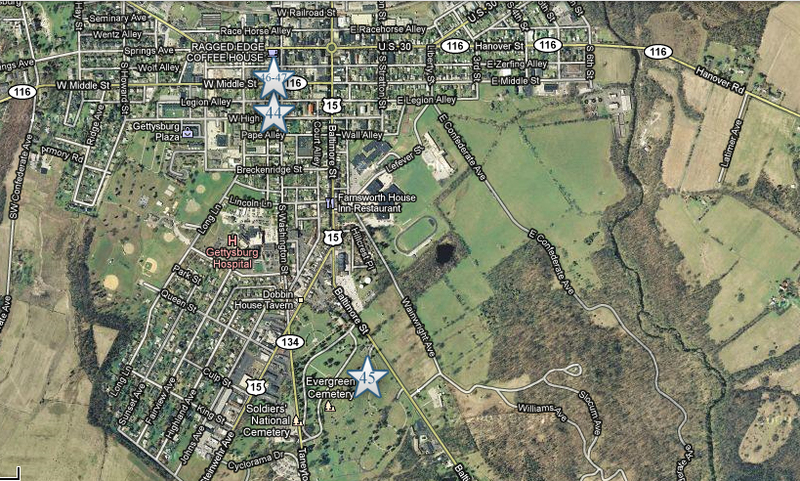 This map shows the location of where our Evergreen Cemetery videos were produced. Videos #1-#45 were shown in our previous Evergreen Cemetery posts. 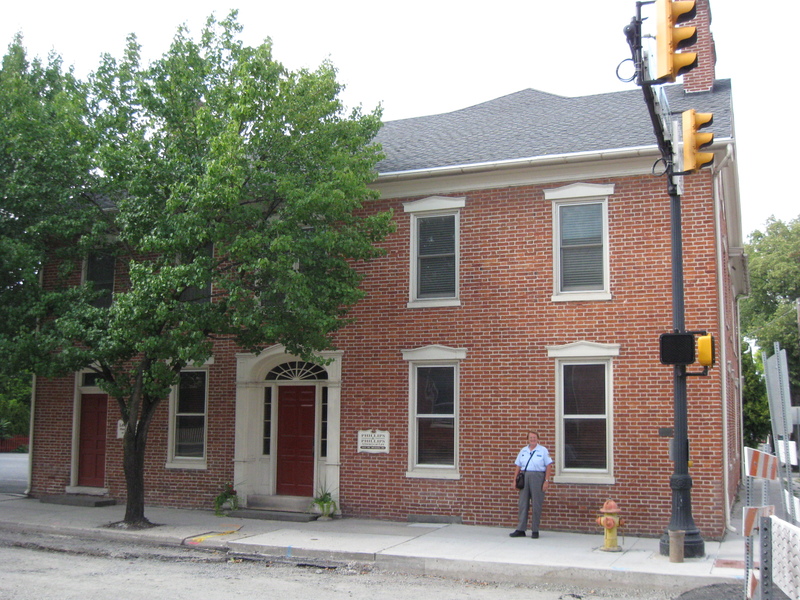 Videos #46 and #47 were taken at the Michael Jacobs House at the intersection of High Street and Washington Street. 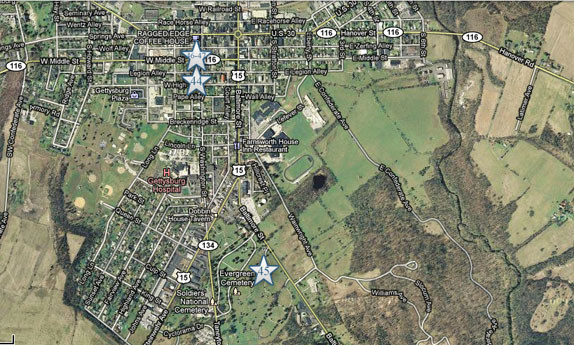 This map was created facing north at approximately 2:30 PM on Friday, August 26, 2011. 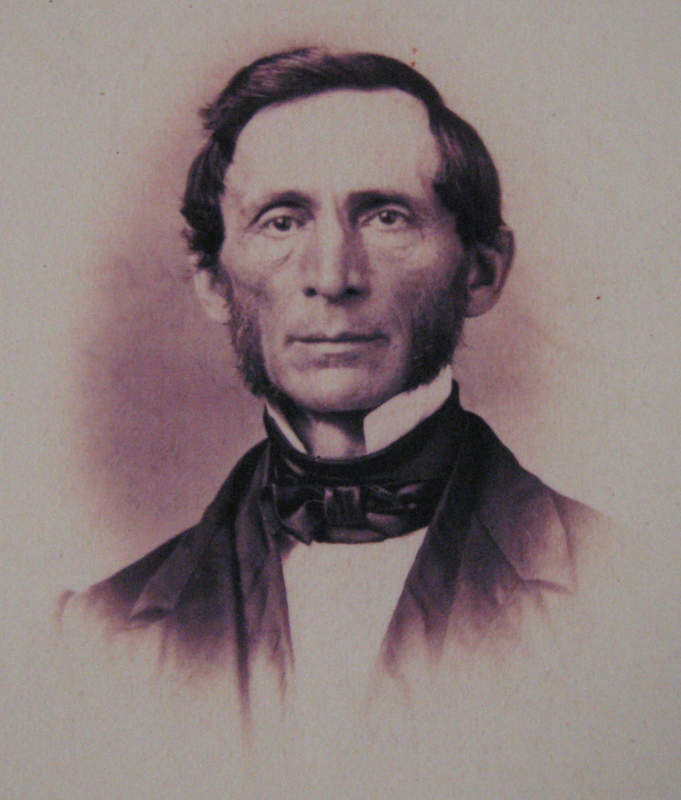 Michael Jacobs (1808-1871) was born in Franklin County, Pennsylvania on January 18, 1808. He attended Jefferson College in Canonsburg, Pennsylvania from 1823–1828. Jacobs moved to Gettysburg shortly thereafter to teach at the Gettysburg Gymnasium, a school founded by his brother David. In 1832, the Gymnasium became Pennsylvania College (later Gettysburg College) and Michael Jacobs was elected to the position of Professor of Mathematics, Chemistry, and Natural Philosophy. The following year, he married Julia M. Eyster of Harrisburg. Professor Jacobs was licensed by the Lutheran Church’s West Pennsylvania Synod in 1832. He served as a clergyman at the Christ Lutheran Church which was the Pennsylvania College church. Jacobs taught at the College until 1866, when he retired as a result of poor health. This view was taken circa the 1850s and is courtesy of Bobbie Phillips and John Phillips. In Video #46 (Videos #1-#45 were shown in our previous Evergreen Cemetery posts) Gettysburg Licensed Battlefield Guide Deb Novotny is at the Michael Jacobs House at the intersection of Middle Street and Washington Street. She provides some background on Professor Michael Jacobs. This view was taken facing northwest at approximately 4:00 PM on Thursday, August 18, 2011. Licensed Battlefield Guide Deb Novotny is standing on the west side of the Michael Jacobs’ House. She is pointing to the window underneath the chimney. Through the attic window located there in 1863, Professor Jacobs and his son Henry Eyster Jacobs watched Pickett’s Charge. 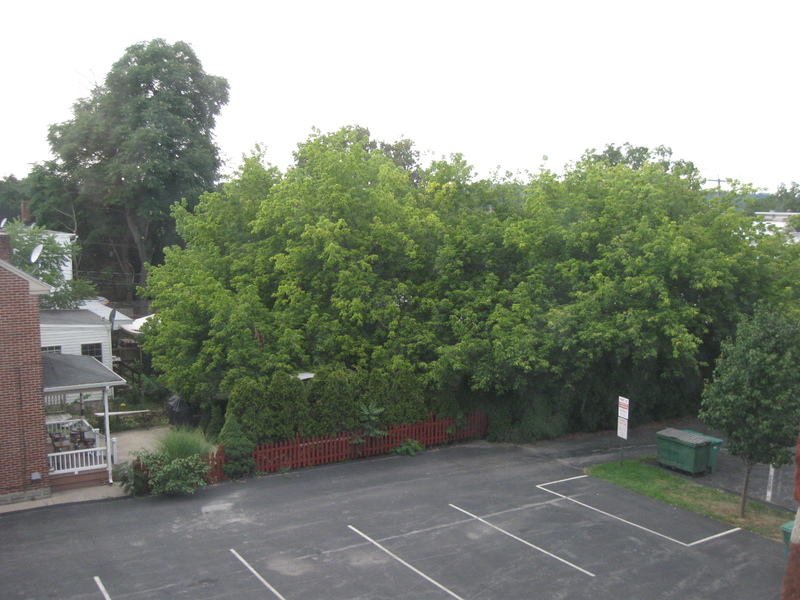 This view was taken facing southeast at approximately 4:00 PM on Thursday, August 18, 2011. Licensed Battlefield Guide Deb Novotny will be showing us the attic of the Michael Jacobs’ House. To get to the attic, one comes up this staircase (yes, that means toward the camera)… This view was taken facing northwest at approximately 4:00 PM on Thursday, August 18, 2011. … and then go through the attic door located here. 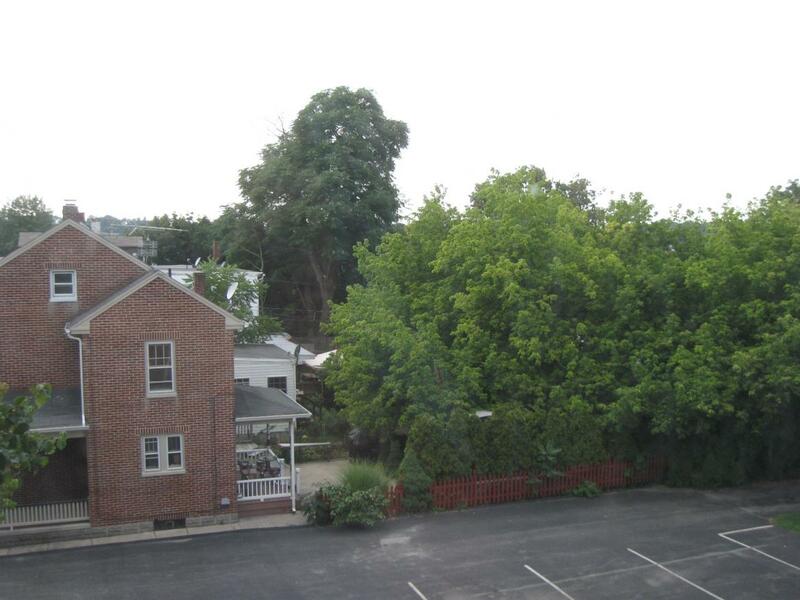 This view was taken facing southeast at approximately 4:00 PM on Thursday, August 18, 2011. 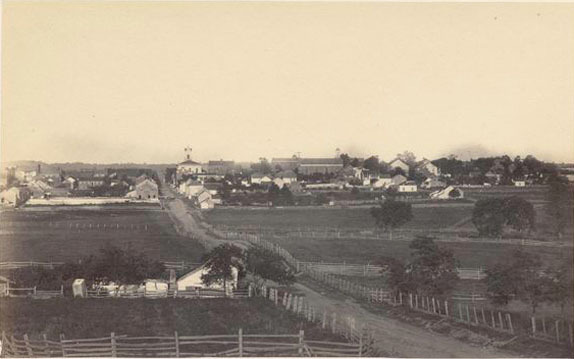 This view of the campus of Pennsylvania College (now Gettysburg College) could not be seen from the Jacobs’ House in 1863, but it was a short distance from the Jacobs House to the campus. 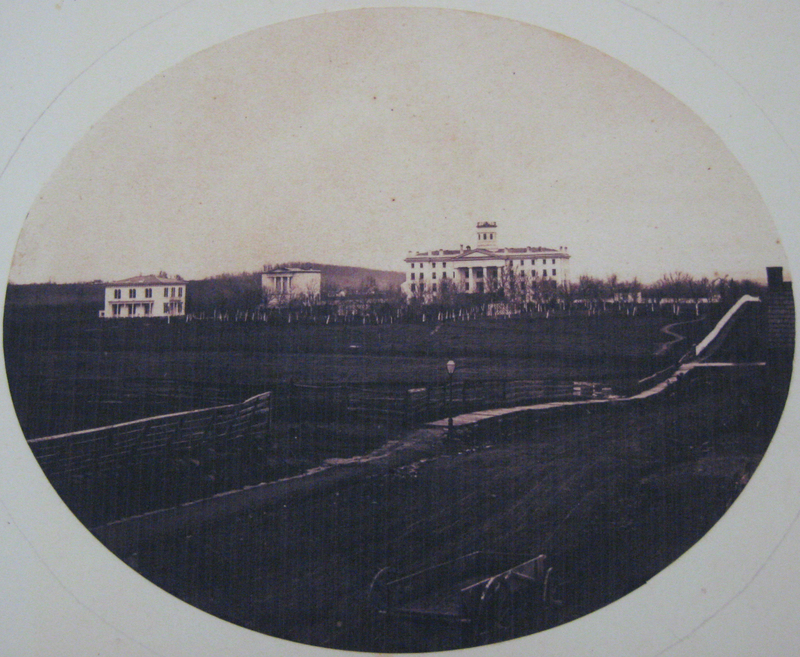 There were three buildings on the campus at the time of the battle, from left to right: President’s House, constructed in 1860 (Henry Baugher was President of the College at the time of the battle); Linnaean Hall, built from 1845-1847, “razed” in 1942 (the Linnaean Association was for students at the college and the Seminary who were interested in advancing the cause of science); and Pennsylvania Hall, constructed in 1837 (the main classroom and dormitory at the college at the time of the battle). Washington Street is in the foreground. Oak Hill and Oak Ridge are in the center and left background. This view was taken facing northwest by the Tyson Brothers in 1862. It is courtesy of Bobbie Phillips and John Phillips. 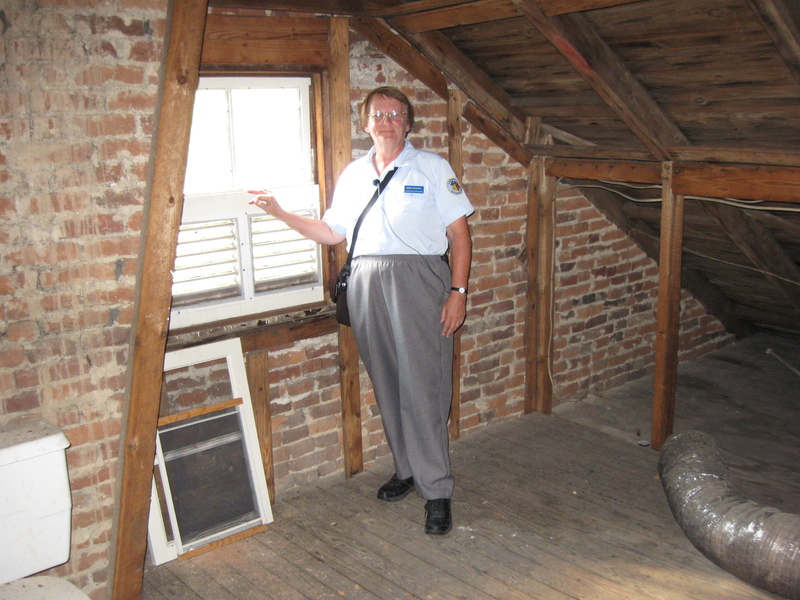 Licensed Battlefield Guide Deb Novotny is in the attic of the Michael Jacobs House. She is kneeling by the window on the east side of the house through which the Jacobs children watched soldiers marching and riding through the town on July 1, 1863. 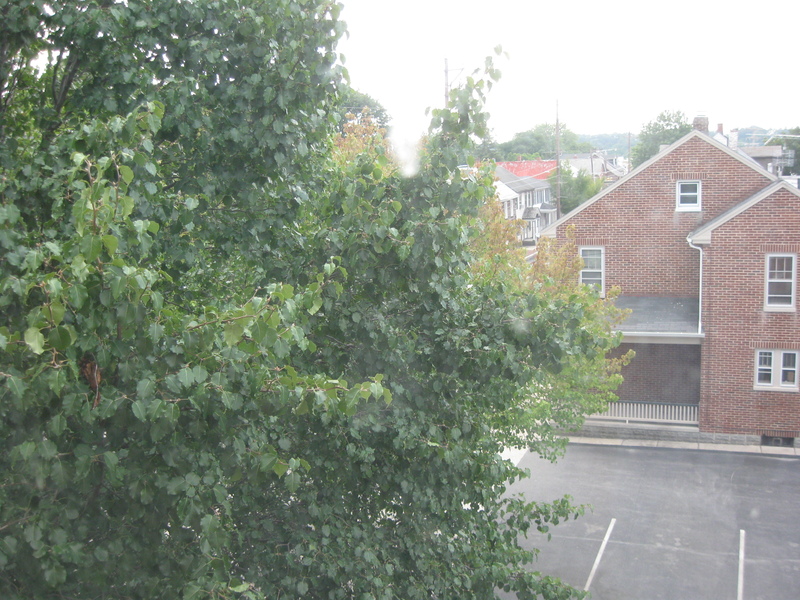 This view was taken facing east at approximately 4:00 PM on Thursday, August 18, 2011. 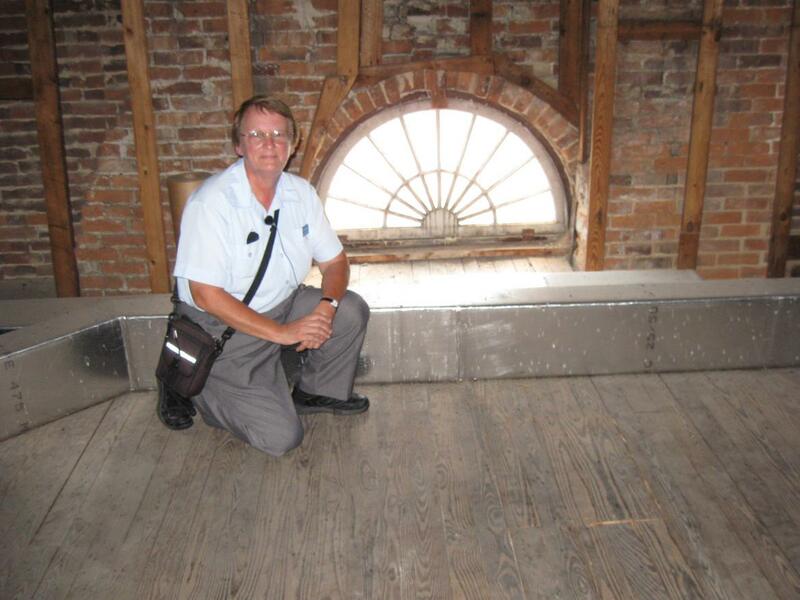 In Video #47 Licensed Battlefield Guide Deb Novotny is standing in the attic of the Michael Jacobs House. 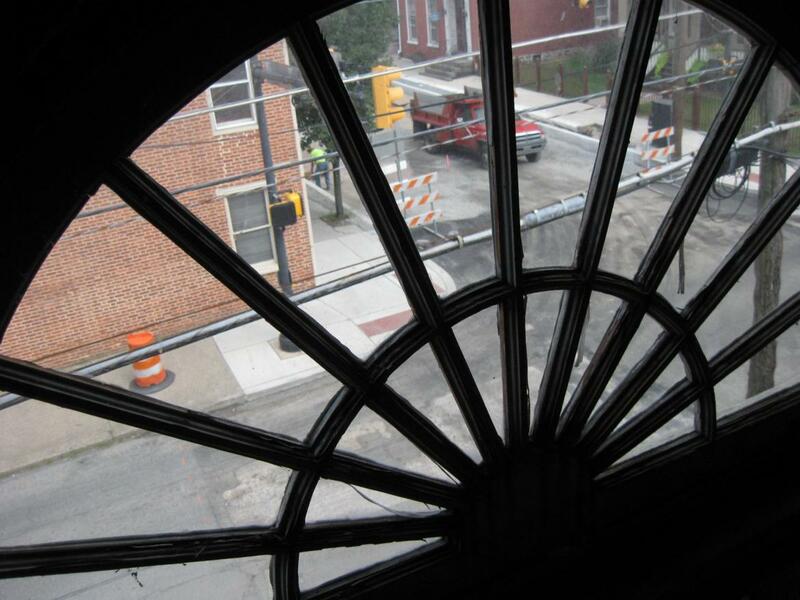 She shows us two windows which the residents used to observe some events during the Battle of Gettysburg. This view was taken facing east to west at approximately 4:00 PM on Thursday, August 18, 2011. Here’s the view that the Jacobs children had as they watched the Eleventh Corps marching to the First Day’s Battlefield, north of the town. Middle Street is where the red truck is located. Washington Street runs north (lower left of the image) to south (middle right of the image). The Eleventh Corps marched to the battlefield from right to left. This view was taken facing southeast at approximately 4:00 PM on Thursday, August 18, 2011. 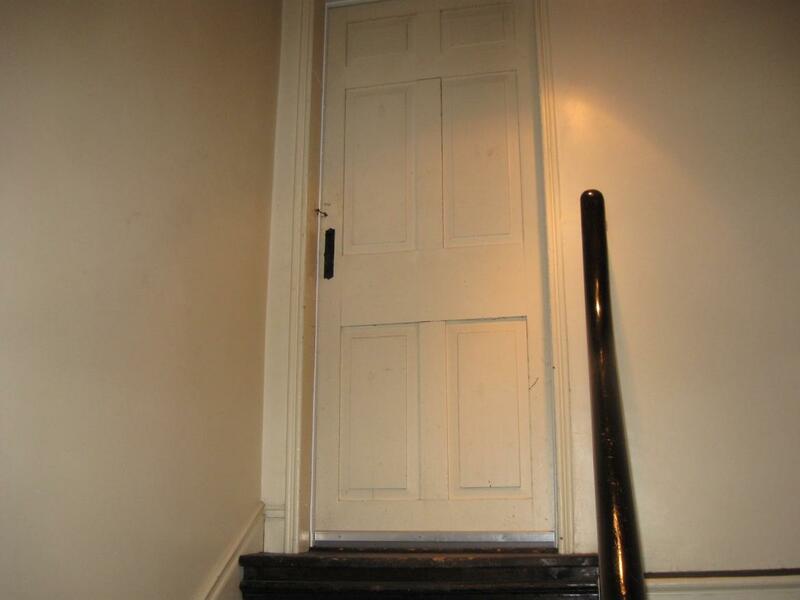 The west wall of the attic/garret where Michael Jacobs and later his son, Henry Eyster Jacobs, observed Pickett’s Charge from the window located here. This view was taken facing west at approximately 4:00 PM on Thursday, August 18, 2011. 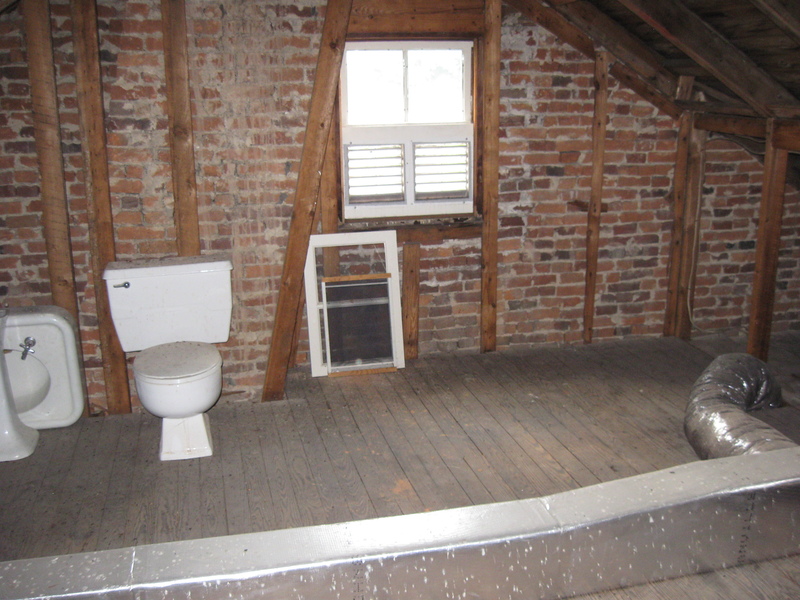 Licensed Battlefield Guide Deb Novotny is in the attic of the Michael Jacobs House. She is standing by the window on the west side of the house through which the Michael Jacobs and Henry Eyster Jacobs watched Pickett’s Charge on July 3, 1863. This view was taken facing northwest at approximately 4:00 PM on Thursday, August 18, 2011. We are looking through the window (probably not the same glass) through which the Jacobs watched Pickett’s Charge on July 3, 1863. We will show you this view from right to left or northwest to southwest as Pickett’s men moved towards the Union lines. 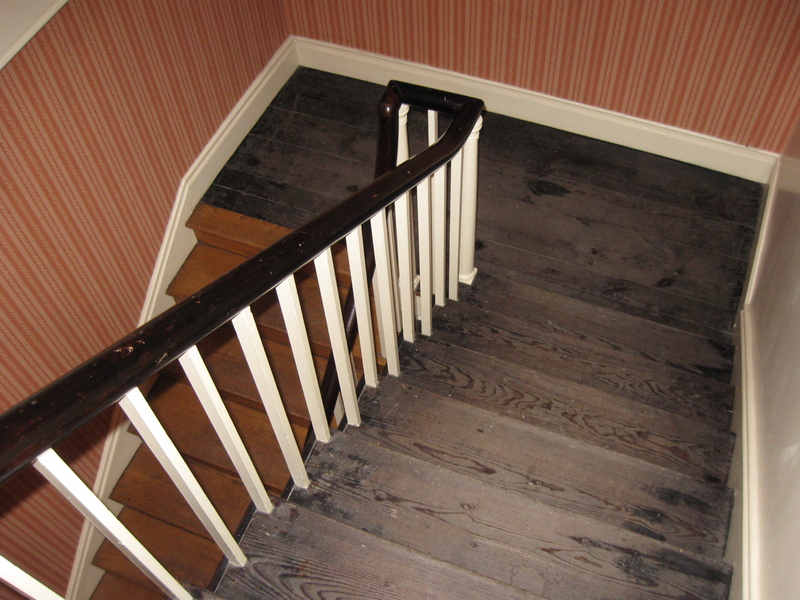 During the bombardment preceding Pickett’s Charge, the family was in their basement/cellar. Then the cannonade stopped, and according to Henry Eyster Jacobs in his memoirs: “This silence again is portentous. There is too much art in it to have been forced. My father cannot be induced to remain with us. He felt by intuition what was coming. He has the glass with him in the garret. There he saw the line of Picket [sic] forming on Seminary Ridge in magnificent array…” This view was taken facing northwest at approximately 4:00 PM on Thursday, August 18, 2011. 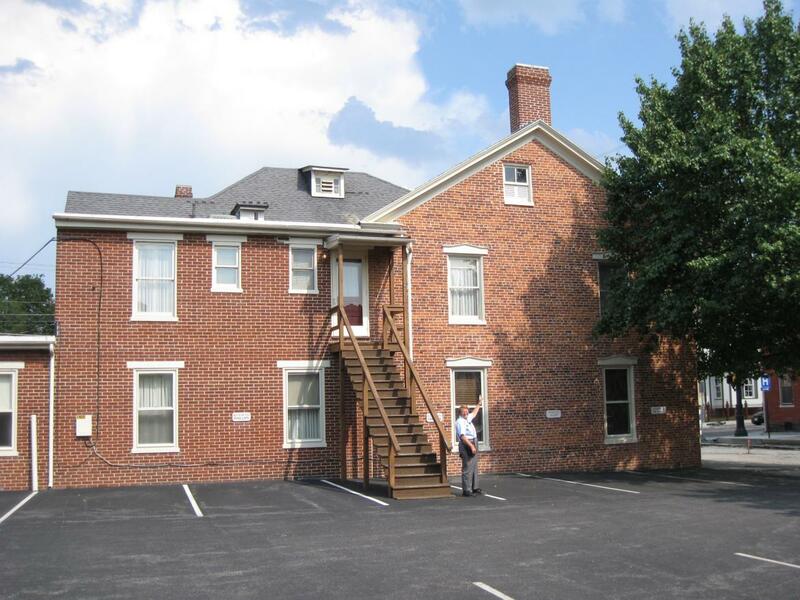 The dark tree line above the house on the left and behind the trees on the right is Seminary Ridge from which the Confederate lines emerged during Pickett’s Charge. Henry Eyster Jacobs continued in his memoirs: “He watched it as it moved steadily forward. At last it is lost to sight behind projecting buildings.” This view was taken facing northwest at approximately 4:00 PM on Thursday, August 18, 2011. Again, the dark tree line above the buildings are along Seminary Ridge from which the Confederate lines emerged during Pickett’s Charge. Henry Eyster Jacobs continued in his memoirs: “Then comes the roar of artillery and the crash of smaller arms. The din is resumed, only the tone is not so loud. It is not long.” This view was taken facing west at approximately 4:00 PM on Thursday, August 18, 2011. We do not have much of a view of the Pickett’s Charge fields from this area in 2011. Henry Eyster Jacobs continued in his memoirs: “He sees them going back, no longer in serried ranks, but as individuals, broken, creeping through the wrecked corn-field, a handful compared to those who had sallied forth. He calls: ‘Henry, Henry. Come, come at once. Here is a scene you will never have the opportunity again to see in your life. It is worth all the risk. Do not miss it.’ I went, and there I could see clearly the stragglers working their way back to the Confederate line.” This view was taken facing west at approximately 4:00 PM on Thursday, August 18, 2011. 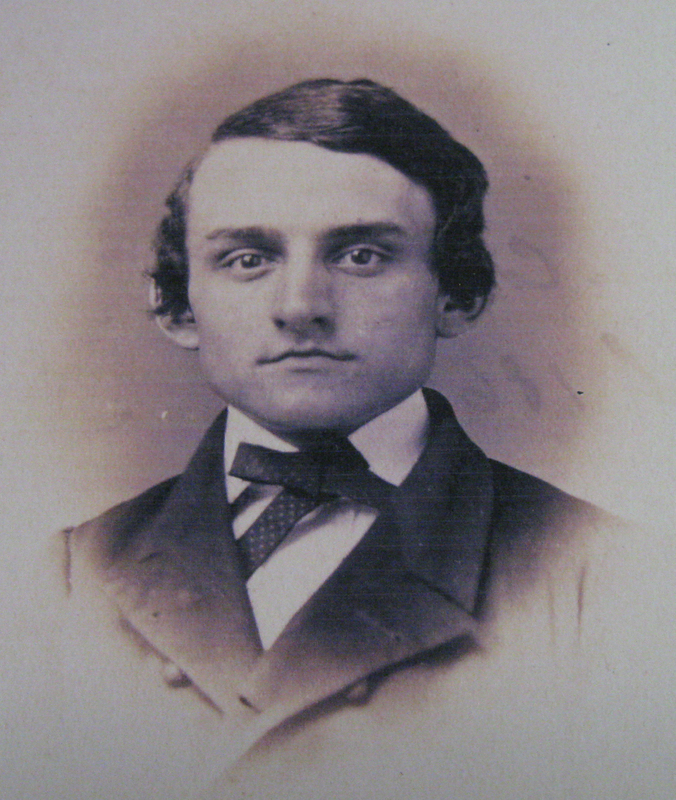 Henry Eyster Jacobs (1844-1932) was born in Gettysburg, Pennsylvania on November 10, 1844. He entered Pennsylvania College (now Gettysburg College) in 1858 at the age of 13, and graduated in 1862 at the age of 17. He graduated from Gettysburg’s Lutheran Theological Seminary in 1865. This image was taken circa in 1862 as part of the Pennsylvania College graduating class album, and is courtesy of Bobbie Phillips and John Phillips. This image was taken by the Tyson Brothers from Seminary Ridge. Middle Street is shown leading into the town. As one enters the town, the third building on the left of Middle Street was the Michael Jacobs House. The open fields to the right (south) of Middle Street show how open this area was at the time of Pickett’s Charge. This image was taken in August, 1863 by the Tyson Brothers. It is courtesy of the New York Public Library. This image was taken from the Cupola of the Lutheran Theological Seminary approximately 26 years after the battle. The borough of Gettysburg is on the left. Wolf’s Hill is in the left background, Culp’s Hill is in the center background, and Cemetery Hill is marked by the dark green trees in the right background. This image was taken by Levi Mumper facing southeast circa 1889. It is courtesy of the Bobbie Phillips and John Phillips. 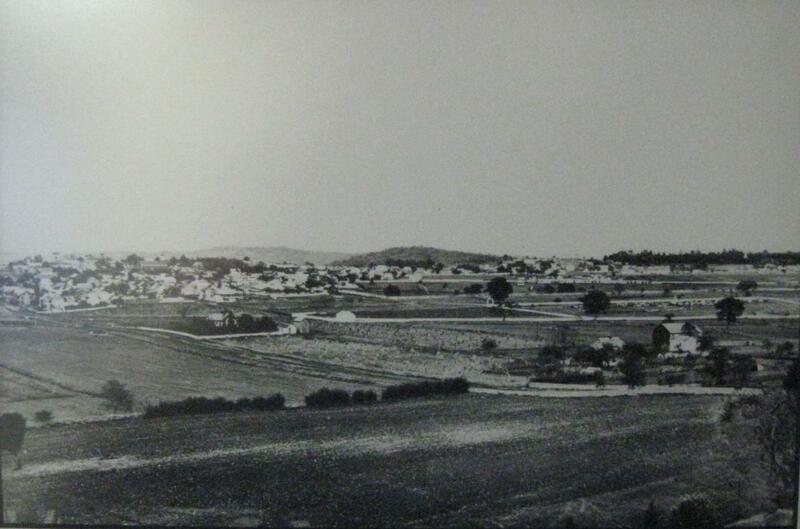 Again, although this is approximately 26 years after the battle, notice the mostly open area between the southern part of the town and Cemetery Hill. This image was taken by Levi Mumper, facing southeast circa 1889. It is courtesy of the Bobbie Phillips and John Phillips. If you can find it for a decent price, the best book on Evergreen Cemetery is by the current Superintendent of the Cemetery, Brian Kennell. 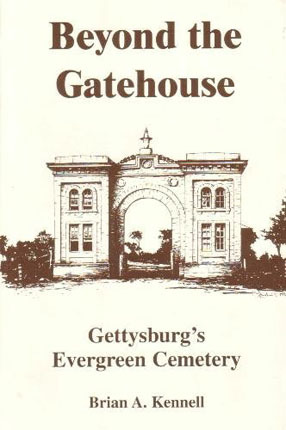 It is titled Beyond the Gatehouse: Gettysburg’s Evergreen Cemetery. For ordering information from Amazon (again probably not the best price), click here.